Thomas lives in a lovely pond with his sister Sally and mother Myrtle. The water is clear, the pond is surrounded by beautiful trees and grasses, and Thomas has a perfect rock to sun himself on when the weather is nice. What could be better? All went well with Thomas's explorations until one day he decided to venture too close to the area where his father had disappeared. He slowly, and cautiously, got closer and closer to the forbidden area until he noticed that the current was getting stronger. He tried to swim away but it was too late and he was swept away. No matter how hard he tried, he couldn't escape the strong current. In moments, he was tossed right over a waterfall, and plummeted down into the dark water below. Would Thomas be able to escape the deep, dark water and if so, how would he ever find his way home? The Adventure of Thomas the Turtle tells a good story about a curious turtle and how his explorations landed him in trouble. Readers will learn about the ideal turtle environment and what turtles like to eat. 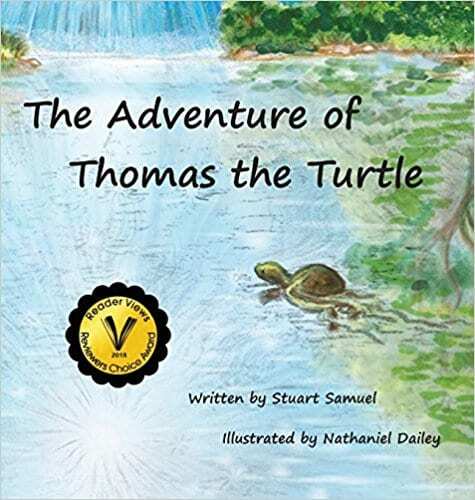 Youngsters will also learn additional turtle facts through Thomas's adventure such as how his shell became dry and hot as he struggled through a grassy hill in search of his pond - he couldn't be away from water for very long. There are points in the story where the narration and dialog are somewhat stilted because of the use of words or terms that are either a bit dated or are for a more mature reader. There is also a recurrent theme with the "forbidden region" and how "an evil force dwells among those waters" that may frighten very young children. It makes sense that the turtles would perhaps think such things since they wouldn't understand a waterfall, but young readers who are sensitive may not enjoy that aspect of the story. Overall, however, for youngsters who are eager to learn about turtles, this book may certainly fill that need. Quill says: A nice story that teaches children a bit about turtles, their habitats and needs.